Palmers Storage offer Easy Storage Solutions by providing a range of short term storage services that are affordable and convenient. If you are downsizing or just decluttering your life then Palmers offer three storage modules with sizes, 3.5m³, 8m³ and 10m³ to help, with prices starting from $11 per week. Declutter your home or store while your overseas, whatever your storage needs, we have short and long term storage solutions to suit your needs. If you need small or large storage space, we can provide. We also store for businesses and factories, who have run out of space or recently downgraded. Store your way, with mobile self-storage options available for delivery to your home or business. We also offer Sydney’s premium container storage, with our large facility able to hold hundreds of containers. These are two great solutions for when you need your storage delivered to your home or business without having to move it all out of your storage locker, into a truck or van and then back into your space, be it factory floor or home. Packing material is available, including cartons, wrap, butcher's paper, tape, etc. We offer the full storage service, not matter what your needs or problems, we deliver every time. We have the experience having been storing and moving peoples belongings for over 30 years. Because of this, we have dealt with a number of different and unique storage needs, which is why when we say that we can handle anything, we mean it. If you need to declutter then ask Palmers for a great value storage solution to suit your requirements or call (02) 9742 6662. When you choose Palmers we make sure to go above and beyond for your needs, giving you the best possible at the cheapest possible price. Get one of our staff to help you securely store your belongings, packing them to avoid and potential damage and storing them in your chosen storage unit. Our versatility is our biggest strength; we can offer a variety of storage solutions compared to other storage companies that only offer one type of storage. We can offer storage for all and any needs, that’s the Palmers Storage difference. Our storage options can also be tailored to your needs. For example, our container storage can be used for overseas removals. We’ll send the container overseas to one of our many international partners where they can store it until you need it or deliver it straight to your new home. 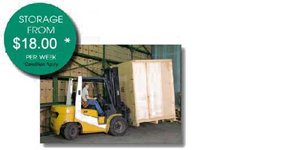 Mobile storage units can be transported all across Australia. We aim to please, so if there is anything we can do to make the move into storage easier, please ask one of our friendly staff. To find out more about the best storage service is Australia, fill out our quote form or call us on (02) 9742 6662 and get a free consultation and quote from one of our friendly staff.